The Comark High Accuracy Reference Thermometer PT100 is every industry’s essential equipment if depending on thermometers as part of your daily routine. The Comark High Accuracy Reference Thermometer PT100 is used to monitor the calibration of all types of thermometers and probes ensuring complete accuracy in the measuring of temperatures. Platinum resistance thermometer technology and permanently attached PT100 probe provides the Comark High Accuracy Reference Thermometer PT100 with highest system accuracy. Due to the date on the UKAS Certificates we are unable to keep this item in stock. Delivery will as a result take approximately 10 days, we apologise for the inconvenience. Most hand held digital thermometers are not waterproof, ONLY the metal probe can be used for liquids, NOT the handle and Not the cable. Absolute Calibration UKAS ISO17025 accreditation assures the customer that all measuring equipment has an unbroken chain of traceability back to national standards, therefore by definition all calibrations performed by Absolute Calibration are traceable to national standards. If your quality assessor asks you to demonstrate traceability, you have already achieved this by using Absolute Calibration. In our experience there is increasing confusion over whether companies require UKAS calibration certificates or calibration certificates traceable to national standards. If your quality assessor instructs you to have your instruments calibrated to UKAS, please ask if that means an actual UKAS calibration certificate or traceable to national standards. If you are unsure please check with the governing body of your industry. 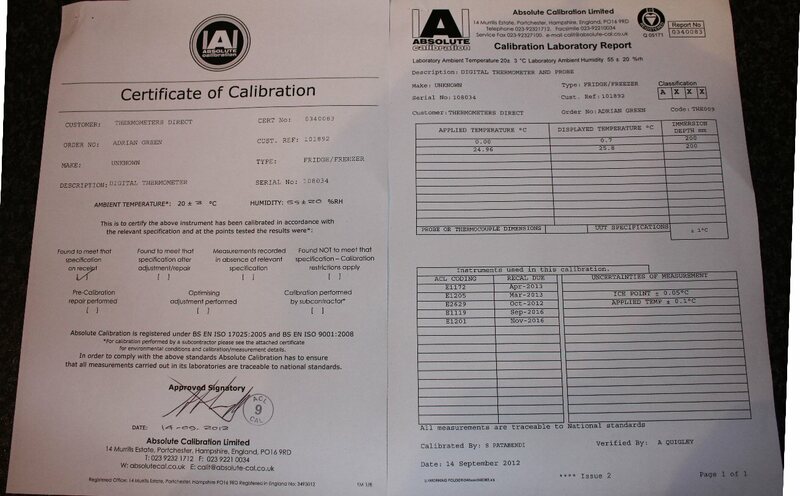 If your customer or regulatory body does not require you to have a UKAS calibration certificate then it is up to you to decide if which type of calibration satisfies your production and quality requirements. or £42 Inc Vat each for a 2 point FULL UKAS Certificate. Charges are for pass or fail of your thermometer. You will need to send us the thermometer and turnaround is approx 10 working days.